Last friday I played a game of 40k against my friend Ron and his marauding band of Orks. For the first time in years I used my all infantry imperial guard army, consisting out of one platoon of Praetorians and two platoons of Mordians, supported by ratlings, battle psykers and roughriders. I spent some of my precious (cough) time painting up the last models and was looking forward to trying them out in Sixth edition. Below my proud army on parade. The battle itself was an enervating affair. The table setup looks quite open, but the walls across the centre of the table blocked a fair bit of line of sight. 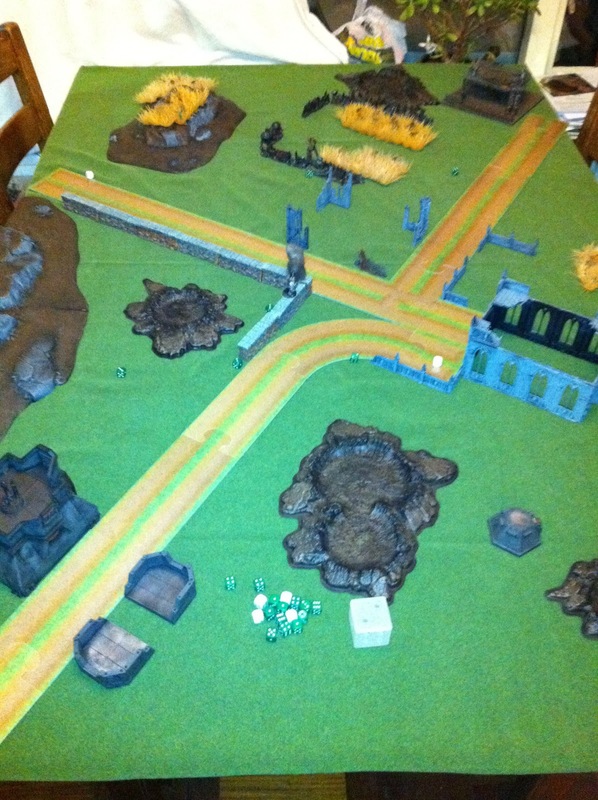 Each of us had an objective to defend, and we played across the length of the table. This meant that I didn't have much chance to capture the enemy objective. The only unit capable of reaching the enemy objective were my outflanking sentinels. I decided to dedicate one full patoon on my right flank to try to assault the enemy objective. 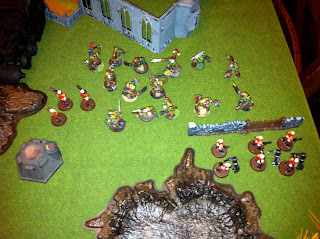 They were supported by the mortars, psykers and ratling snipers, whose task would be to try and take out as many of the orks between third platoon and the Ork objective (which was left to a few late arriving gretchin to defend) as they could. I placed my own objective behind the bunker ruin, guarded by my trusted first platoon and captain Smith, Ponsonby, Arthur C. Drake (he get's a new name every time he dies) himself. I left the rough riders in reserve and set up 2nd platoon in the centre, ready to support either flanks and well positioned to take out the ork transports. The orks on the other hand deployed as much forward as possible, ignoring their own objective. 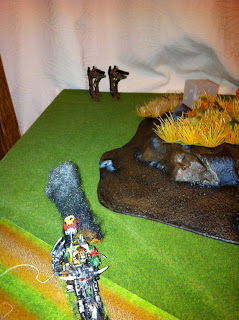 Ron's horde included two truckmobs, one of which was acompanied by his warlord. he also had a bikemob of six, three kans and a defff dread, 20 shoota-boys on foot, ten loota's and last but not least 20 'Ard boyz in a Battlewagon. I hoped to use my first turn to take down his transports so his assault would slow down and I could get in a few rounds of decent firing before the general melee ensued. Determined to stick to my plan I advanced third platoon and readied my dice for an awesome return volley of my own, which resulted in not much more than a single shaken result on one truck, and a fair few casualties on a mob of orks trying to run towards third platoon. Fourth turn brought some relieve in a lucky salvo killing the remaining orks of a truck mob and having the warlord fail three saves, just killing him and netting me another victory point. With supportfire from 2nd platoon, 1st platoon managed to kill of the orks trying to assault my company command squad (Ron had rolled 3" for his assault distance in the previous turn). And finally my rough riders arrived, seeking shelter behind the bunker, because they couldn't charge in the turn they emerged from reserves (darn 6th). The twenty-odd strong mob of árd boys that had emerged from the battlewagon proceded to roll up my entire left flank, killing the psykers, the mortars (who had their moment of glory when they survived the shooting and assault of an ork deathcopta and clubbed him to death with their lasgunbutts in the previous turn) and most of the remains of 2nd platoon. Fifth turn came along and it looked like I might still grasp a draw out of the claws of defeat. Night fell and if I'd manage to destroy the Ard Boyz, and the battle ended after the fifth turn, I'd have four victory points and so would Ron (we thought only troops could claim the victory point of being in the enemy deployment zone). My brave cavalry emerged from hiding and sounded the charge, covered by lascannon fire from the last remains of first platoon. Ron had moved his boyz forward toward my troops in the previous turn, underestimating the roughriders because he forgot that they had Str5 powerweapons. Although the orks managed to down three Lancers with Overwatch fire, the horsemounted guardsmens charge crashed home and killed all but one Ork, who stubbornly refused to run (snake eyes....). Alas the dice decided that another turn would follow and the orks (or should I say heavilly armoured Gretchin: those grotzooka armed killa-kans easilly killed a third of my army...) proceded to wipe most oppostion before them, felling brave captain Arthur C Drake in his command post, leaving only the paltoon command squad of first platoon to tell the tale. That concluded an evening's worth of slaughter, almost 150 dead guardsmen and a good 70 dead orks later, the greenskins emerged victorious. Ron played a good match: he launched his army headlong into the assault, persevered when things didn't turn out as he expected and used his ranged assets (loota's and killakans) to decimate my shooting units. 6th edition lets units move and assault faster, and having the initiative seized from me, coupled with a horrible first and second turn shooting, meant the death of my army. 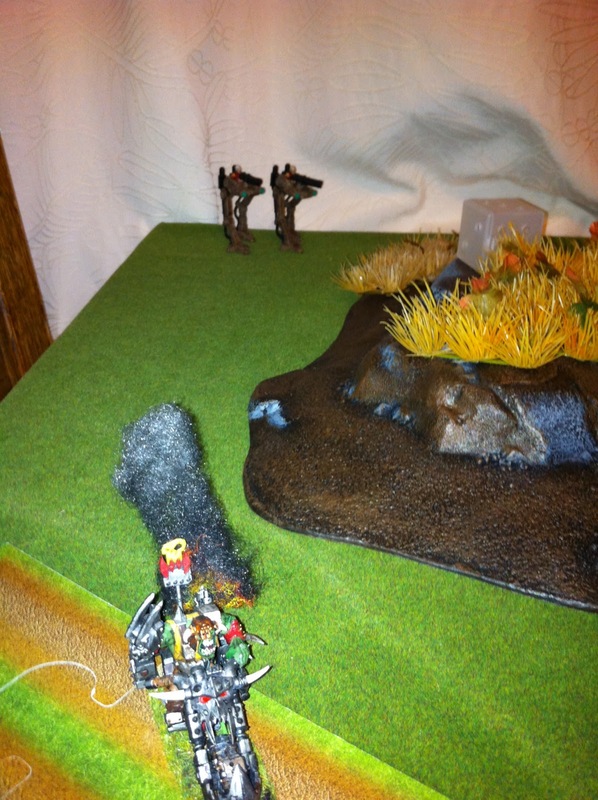 I keep underestimating the firepower of ork units, and should have made better use of my picket squads. This army also lacks offensive units, something that wasn't a problem in 5th, but is a serious liability in 6th, because i had no real chance of threatening Ron's objective. I'll have to see what I can change to the army without loosing it's victorian feel. 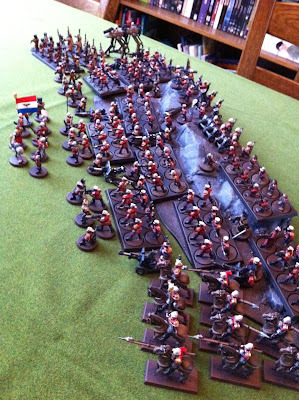 Penal troops and stormtroopers come to mind, but in 1500 points I'd be hard pressed to include them.